Finally figured out how to embed (thanks, Maida!). It's weird because the video clip doesn't show up in the composing window until I preview the post, so I just have to trust it's there. Freaky. P.S. Sitting up! Isn't it incredible what mundane things become amazing once our children do them? I'm up this morning for a good cause: my new Cuisine at Home has a recipe for monkey bread made with tiny little cinnamon rolls, and we're going to have it for brunch with my parents and two youngest siblings, who are in town. I'm sure it will be transcendentally delicious, but the hour at which I had to pull myself out of bed this morning in order to get things going for it... well, that was not so transcendental. Currently the caramel sauce is simmering on the stove as per the recipe's instructions, the Billa is still sleeping in our bed, and all is peaceful and beautiful. I've set this to autopost in fifteen minutes, so if it's posted with an abrupt ending, it's because things have gone awry at the other end of the baby monitor and I have had to remove myself from my beloved laptop's side front. I have about a dozen posts brewing but my mind is blank currently. Since my baby is an owl who usually sleeps until nine, I am nonplussed by this dawn-time sunlight. It is something I vaguely remember from pre-college days. High school days started at some ungodly hour like 4:14am, so I must have been catching some sunrises in there, right? Perhaps I got up this early when I had a job outside the home? But speaking of jobs outside the home, you all must read this post by the lovely, intelligent, and articulate CJ. Even if it is the only thing you read this week. I am surprised that my head is still attached, frankly, considering how many times I bobbed it up and down in enthusiastic agreement while I was reading CJ's post. My time is ticking, I hear stirrings from the infant in the bedroom, and the sauce is making suspiciously boiling-over-like noises on the stove. I'm off. I leave you with this piece of art* I took just now. 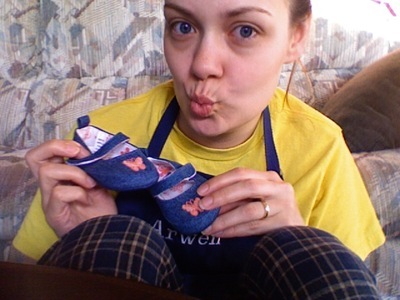 I call it Bleary Eyes with Baby Shoes. *Mayn't I call it art? Photography can be art, you know. What's that? Pictures snapped with Photobooth and entirely unedited don't count as art? Sez you. Philistines. I've finally figured out how to upload from the video camera, and gotten myself a YouTube account. All the cool kids have one, and I'll never be a cool kid but I'll do what they do if it means I get to share videos of the world's sweetest Muffin. Life goes by so freaking quickly with a baby. I'm admiring all the new sounds she's picked up ("da" and "ba" and an adorable little "hhh-t") and I'm convincing myself that when she says "da-da-da-da" and looks at her daddy it's because she knows the word "Daddy" (hint: yeah, right). I'm talking to her in that big animated voice that almost always gets her to talk back, and I'm meditating upon the fact that my daughter is clearly a genius because she learned all these new sounds in about thirty-six hours. And somewhere in the back of my mind a little voice says, "Shouldn't you be writing this down?" I've been blogging for two-and-a-half years now. I started when we'd been trying to conceive for just over a year. I'd discovered infertility blogs online (thanks to some random Googling I did while researching a report on contraception for my Moral Theology course, interestingly enough) and I was feeling tortured about our own fourteen fruitless months of no-baby-on-the-way. The blogs seemed to be a good way for their writers to work through it all, and I thought - hey, maybe that would work for me! So I started writing it down: the pain, the panic, the peaceful moments. The whole caboodle. One delightful surprise of a pregnancy, one birth, and six months of motherhood later, here I am. And, honestly, many days I forget all about what that whole caboodle was like. How could I not forget, with this face to look at all day? I used to ponder the meaning of things but now I focus on the details of life with a baby. 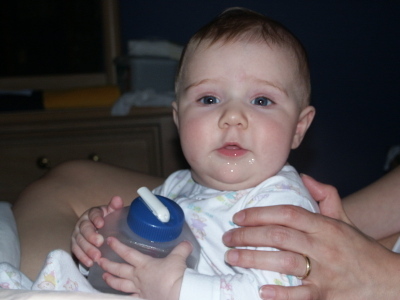 How can we get her to take a bottle again so we can go out to dinner without her once in a while? Are we being too frugal if we finish our current box of size two diapers before buying some size threes, even though the size twos are clearly too small? Where is her hairbrush? Has a tooth popped through yet? Are any of her nighttime sleepers clean? And those details crowd out the little voice that reminds me that this blog is here, clamoring for attention. Writing about infertility helped me tremendously during a tumultuous time, and when I started getting more readers I was gratified and touched to hear that my writing helped them, too. Even now I occasionally get an email from someone going through infertility who has discovered my archives, and - call me sentimental or egotistical - I'm not going to take my archives down as long as there's still a chance of them helping someone. 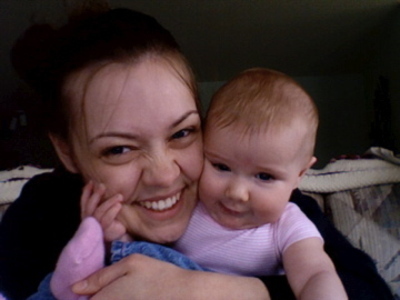 The childless part of my life is over, and this blog is still here. Sometimes I'm just too busy living to remember to write about it. I'm caught up in the ways she's changing and sometimes I'm surprised to realize that I've forgotten things which were a part of my daily reality just weeks ago. 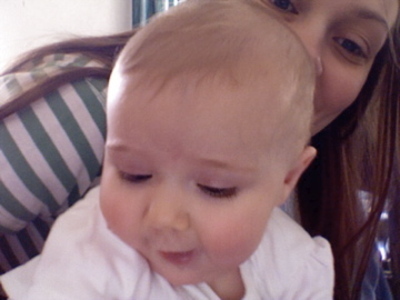 I've forgotten that I used to have to spend several hours a day on my feet with Milla because she was so fussy. I've forgotten that a night where I could get Milla back to sleep by nursing her instead of having to get out of bed with her used to be considered a fantastic night. I've forgotten that she didn't used to laugh, didn't always love to look at herself in a mirror. I've forgotten that she couldn't always hold a toy and chew on it, or sit in her exersaucer without slumping over. I've forgotten that she used to hate tummy time. And she's only six months old! Imagine what I will have forgotten by the time she's three. The friends I made on the Internet - all of you - were a huge solace to me during the years we waited for Milla. Now that she's here, I feel like you have a share in her. You rejoiced with me when we discovered she was on the way, you commiserated with me when her tiny presence was making me feel like death warmed over, you helped me prepare for her arrival, you got excited about her arrival, and you said millions of wonderful things about her the whole way through. When she's older I'll tell her what a lucky baby she was, how she had so many people waiting for her and praying for her and wishing her well, and what a blessing that was and is. I want to write because I want to share her. The details of life keep rushing at us, and always will. I used to sit down and write a post in an hour or two, but now it takes me days. Because of this I write less, and sometimes there is more than a week between posts. I've got things to do, you know. 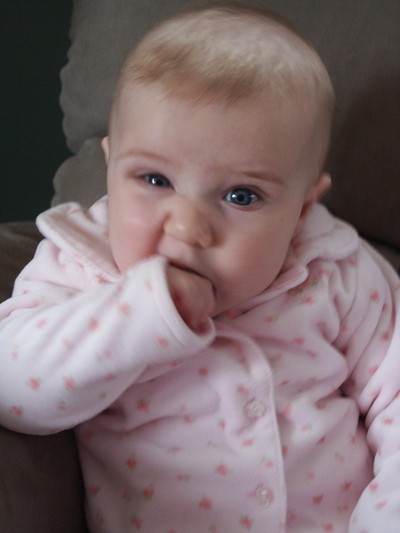 Those delicious baby cheeks won't kiss themselves. But I'll always be back, never fear. WE will always be back. "You are soooooo in for it, lady." Joking aside, I do think I gave a little bit of a mistaken impression of how much we hold Camilla. Yes, we hold her the large majority of the time, but we also put her down. We would not currently be in possession of one bouncy seat, one rocking seat, one portable swing, one cradle swing, and one exersaucer (disclaimer: two were gifts, two are on loan) if we did not believe in putting her down. And she doesn't cry every time we put her down. To the contrary, she's actually getting better at being put down. I give her ample tummy time every day, and she'll happily spend short periods in a chair or the exersaucer watching me cook or type or whatever. It's not being put down that upsets her - it's having me (or Bryan) leave her sight that upsets her the most. Last night Bryan was changing her diaper and I walked from the changing table to the other side of the room - staying within her sight the entire time, even - and she started crying like it was the end of the world. If this was permanent, it would be insane, but since it's temporary, it's totally manageable. In fact, when you weigh it against these grins, I'd say we're coming out ahead of the game. I find it interesting that many people seem to have the idea that holding a baby too much, responding to her needs too quickly, is a bad thing. And when I say I find it interesting I'm not being passive-aggressive and meaning that I find it crazy; I really do find it interesting - and completely understandable, considering I used to have that idea myself. But now I've been a mother of a fairly high-needs baby for almost six months, and the more I see the more I am convinced that people think we have way more control over how our babies act than we actually do. Discipline is certainly possible with toddlers and older children who have powers of reasoning and the ability to act willfully. But with babies - who, as far as I can see, respond to stimuli rather than acting willfully - it just doesn't seem to me that we have that much control over their wants and needs, or over the way that they express them. 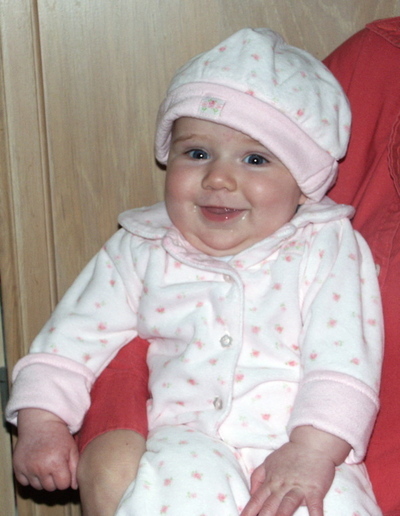 For example, when Camilla was in the three- to four-month-old range, the only way we could consistently get her to go to sleep was by putting her in the sling and bouncing her. I had a conversation with my sister at about that time where she (who hasn't used a sling with Daniel) expressed dubiousness about the sling. She could see how it was a boon to us to have such a dependable way to calm Milla down, but she wasn't sure she'd ever want to use a sling herself if it meant her baby would "learn" to go to sleep only in the sling. And while I myself was grateful to have the sling as a surefire baby-calming method - before we had it, there was no surefire way to make Milla stop crying - I accepted my sister's premise because it did seem like we'd taught Milla to need the sling, and it seemed like she'd continue to need it for a long time. But a month later Milla started needing the sling less and less, and another month later I've got a whole bag of tricks that will get her to sleep more often than not. I can put her in her swing and sit by her and sing, I can hold her in my arms and bounce her, I can put her in a sling or the Ergo, I can nurse her, or I can take her for a walk in her stroller. All of these things will work more often than not. Her need for the sling has gone. We didn't make any effort to wean her from the sling; it just happened. And we'll never know whether she's easier to calm now because we had such a dependable way to do it when she was younger or, conversely, whether all the methods we use now would have started working earlier if we hadn't been using the sling all the time. Frankly, I don't care. But the point is that I thought we'd taught Milla, by treating her a certain way, to always need that treatment - and it turned out to be completely untrue. However, it is true that hydration is extremely important. Because of this, I'm resistant to the idea that by holding Camilla a lot and responding to her needs "too" quickly, we've "trained" her to expect us to hold her and respond to her immediately. I'm also resistant to it because the evidence suggests otherwise: a while ago, after months of constant attention, she started needing less attention, so we started giving her (a little) less. Then she started wanting more attention again. If it's true that more attention makes a needier child, it should have happened the other way around. But regardless of why Milla is clingy, the fact remains that she is, and we have to deal with it. I'm okay with dealing with it by letting her fuss a little when I need a few moments to finish a task, if she's clearly annoyed rather than scared and I'm within sight. I'm also continuing to try putting her down and leaving her sight momentarily - while using my voice to maintain contact - so that she'll maybe get used to the idea that I always come back. I'm not okay, however, with letting her cry if she sounds at all scared to me, or with letting her cry if she can't see me, for longer than the moment it takes me to wash my hands or whatever I have to do. I do understand that it's necessary to let her gain some independence, but as long as her motor development and social development are on target, I don't see a problem with having her in my arms the large majority of the time. Granted, I'm not an attachment expert, but I want my baby to be happy and secure in her environment, and my instincts tell me that holding her is a good way to advance that cause. P.S. 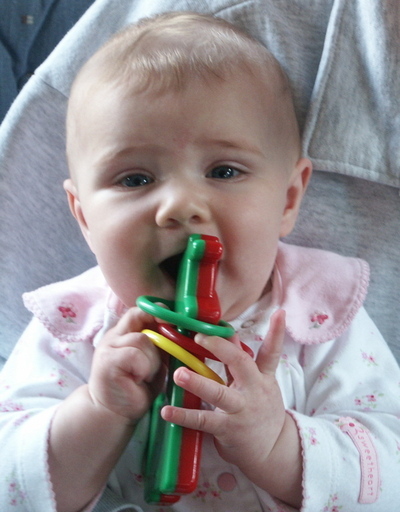 I think you were also right about the teething.